New wood flooring is one of the most gorgeous ways to boost your home’s value, the aesthetics of your home, and your personal enjoyment of your living space. The right shade of hardwood will enrich your home in ways that you can’t even imagine. However, you will need to make one important choice before the installation process can begin—which direction will you lay your new wood flooring? This subtle choice can actually make a big difference in the way that visitors see your home. Here are some of our top tips for choosing which direction to lay your new wood flooring. The direction that your wood flooring will run is not just a matter of personal taste. It also is governed by several design principles. The wood planks that make up your new wood flooring should be laid out in a manner that leads to the center or focus of the room. Do you have a fireplace that you want to highlight? Is there a particularly beautiful architectural detail that is the center of your living room? The wood flooring boards should be placed leading in that direction. How does the light fall in your home? Depending on how light falls on the flooring, it might make the room look longer or shorter. As a general rule of thumb, run wooden boards from the entrance outwards to make your room feel bigger or longer. If you want your room to feel smaller and warmer, lay your wood flooring from side wall to a side wall. Whenever you are placing wood flooring in a hallway or any long and narrow area, it should run in the direction away from the doorway. When laying hardwood flooring throughout your home, you need to take special care in choosing the direction that the wood will be placed. 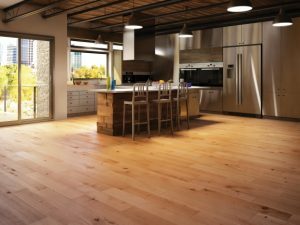 If you have an open concept room, it can seamlessly integrate with another large room if you install wood flooring from one long end to another. Rooms that are strangely shaped might not look visually proper with the wood changing direction from hallway to room without a transition piece. Use a thin piece of matching hardwood flooring to define the area where the direction changes from horizontal to vertical. Last, but not least, the direction that you lay your hardwood flooring should match your personal preferences. Take the time to visit a showroom and see how different hardwood flooring directions change the way that a room flows. The best hardwood flooring direction for you is always the direction that matches your home and your design aesthetic. Do any of your friends or family have hardwood flooring in their homes? Next time you visit their homes, take the time to pay attention to how the hardwood flooring is placed on the floor. Does it add to the architectural features of the room or detract from them? Is there a center point of the room that it leads to? The more that you pay attention to the direction that other hardwood floors are pointed, the easier it will be for you to make your decision. This entry was posted on Tuesday, June 27th, 2017 at 2:04 pm. Both comments and pings are currently closed.